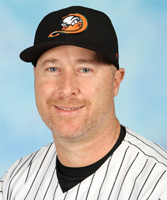 Ford begins his 10th season as a member of the Ducks and sixth in a player/coach role, having spent two years as Hitting Coach (2014, 2018) and three as Bench Coach (2015-17). The outfielder/designated hitter is the franchise’s all-time leading hitter (minimum 500 at bats) with a .322 batting average. He has played 675 regular season games with the Flock, totaling 71 home runs, 413 RBIs, 440 runs scored, 186 doubles and 245 walks. In addition, the Central Islip resident has appeared in 42 playoff games with Long Island, registering a .269 batting average, four homers, 21 RBIs, 18 runs and 47 hits.